Have you fitted your dog’s harness properly? As I walk through our city and my heart swells with pride for these sweet people who have chosen harnesses over collars or inhumane equipment, my heart also sinks just a little. We have so many tools available to us as dog-guardians and yet very little education comes along with these tools. Yes, there are warnings on shock collars that send electric currents through a dog’s neck at the press of a button. Yes, there are warnings on the spray collars that mist our dog’s faces with toxic substances. 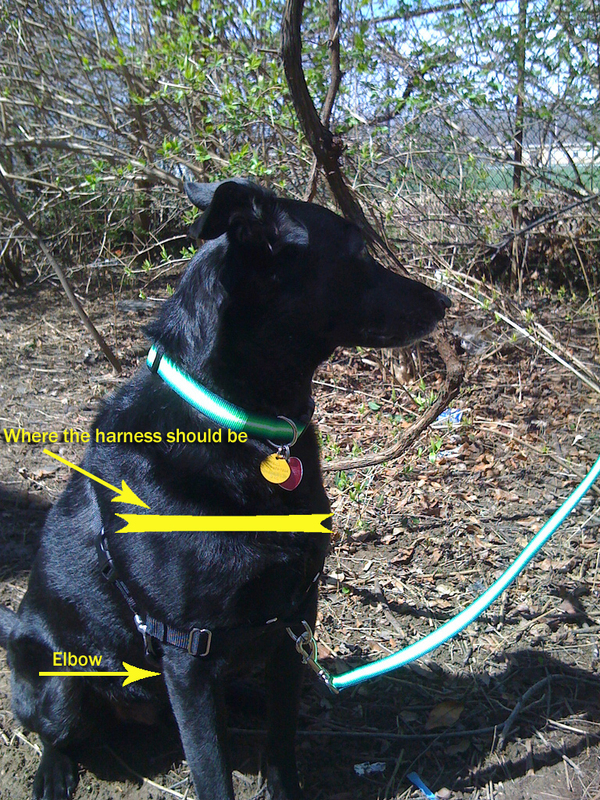 But there are no warnings on choke chains and prong collars – two types of collars that have been known to cause significant damage to a dog’s neck, trachea, spine, eyes, etc… And even still, there are no warnings on our humane equipment such as front-clip harnesses. I am a huge advocate for harnesses; in fact, harnesses are on the verge of becoming mandatory in our classes. That is how passionately I feel about this. However, there is a right way and a wrong way to fit these harness to avoid injury, affecting gait, causing long-term damage, and of course to keep our pets attached to us rather than breaking loose and running through city streets. Ignoring the tension on the leash, this harness is fitted perfectly. It is snug-fitting on all straps, but not too tight, causing bulges in the skin. It is just above the shoulder joint, allowing a free range of motion in those front legs. The belly strap is not being tugged forward in a sideways “Y” position, it’s a nice sideways “T” position. The front is not flappy, loosely dangling, pulled off to the side or up into the neck or chin. This harness is very loose-fitting and will likely rub and chafe. The chest strap is resting on the elbow, preventing range of motion. This dog could easily step out of this harness and get loose. When fitting a harness, it’s important that it is done with care and attention to detail, ensuring it is not so snug that the skin is bunching, but that it sits comfortably atop the skin and two fingers fit underneath. If it is too loose, it will likely rub, chafing and causing loss of fur in that area. Watch the front strap – the ones that travels horizontally across the chest. does it pull that belly strap forward? If so, it will need to be loosened. The front strap should be snug across the chest, leading across and above the shoulder joint (never meeting the “armpit” so to speak), allowing for a full range of motion without interference. Harnesses, like collars must be checked regularly for wear that might cause the fabric to break down and tear, as well as for a proper fit – dogs weight can fluctuate even when they’re done growing. If your dog’s harness is not fitting quite as nicely as we’ve described above, please let us know and we can do a fitting for you and suggest a more appropriate brand (not all are created equal) if need be. Send your pictures of your dog in their harness – we’d love to see them! invest in a good quality harness once your dog is done growing and take good care of it – it’s well worth it! Caryn is a Toronto-based “people-trainer for dogs” and a Certified Professional Dog Trainer through the Certification Council for Professional Dog Trainers (CCPDT). She is the founder of Whatta Pup!, a pet dog training company established in 2008. Seeing a growing need for specialized training due to an increase in aggression in Toronto, Caryn co-founded The Toronto Centre for Canine Education, specializing in “the socially-challenged dog”. 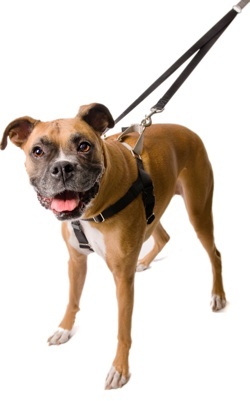 2 Responses to Have you fitted your dog’s harness properly? Hi Jennifer, I’m glad you enjoyed it! I’d be more than happy to fit it for you – absolutely. I might even be there early today so I’ll see if I can pop in before you leave to save you a trip!